I originally wrote up my 1952 Topps #5 card for the Things Done to Cards blog in 2008, still readable there. That post rambled a bit, so let's see updated scans and take a more practical tack. 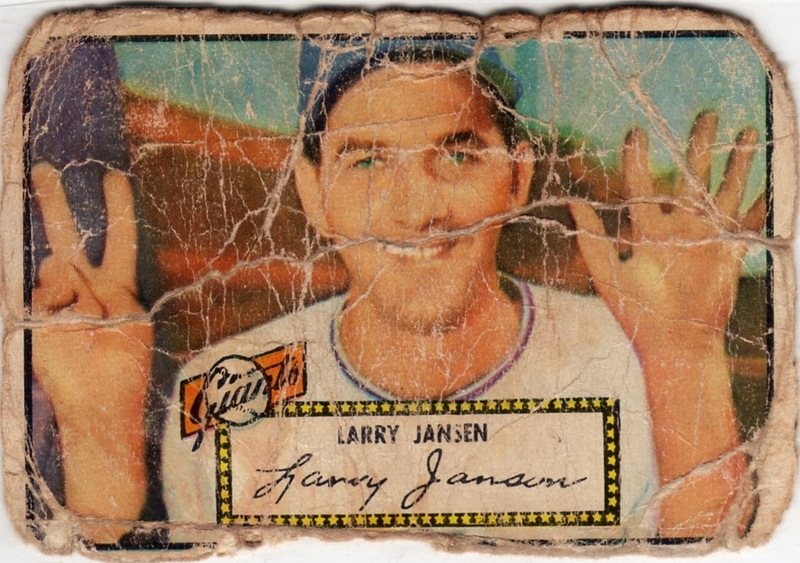 This hammered 1952 Topps #5 features pitcher Larry Jansen, a workhorse for the New York giants. 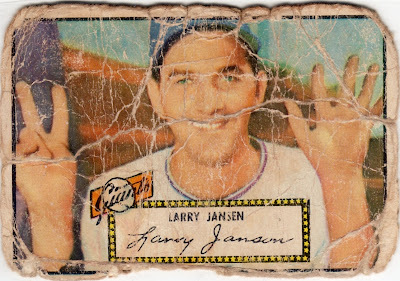 He's holding up one finger for each of his seven children, something I'd be amused to see on a 21st-century player's card. 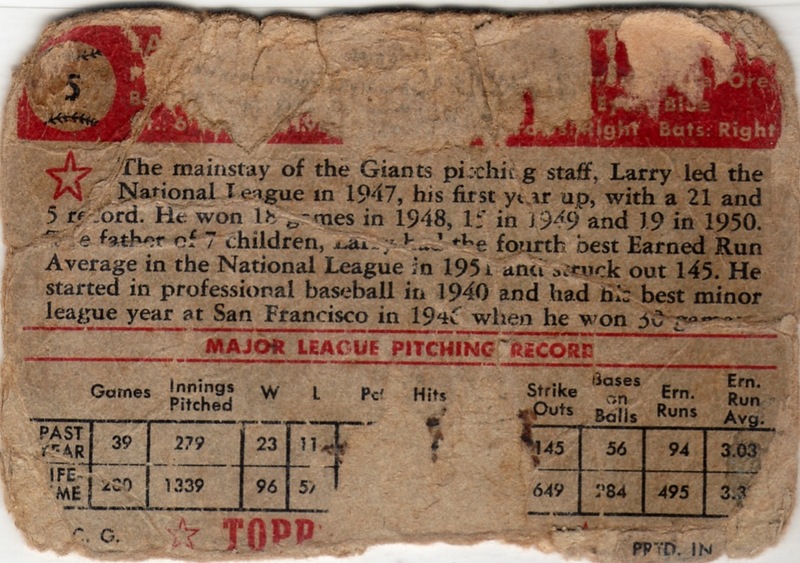 Amazing wear on the back, yet the card number and bio survived. Judging by its blob of pink paper at top right and missing chunk in the middle, it looks to have been mounted in an album and later forcefully removed. Here's a #5 version you could actually take home to mom. 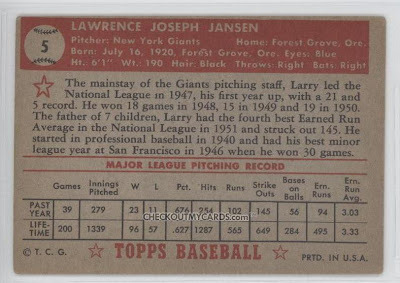 Value: CheckOutMyCards.com lists the mid-grade scan above for $17.50. My thrashed version should run a few dollars, assuming a dealer stocks it at all. 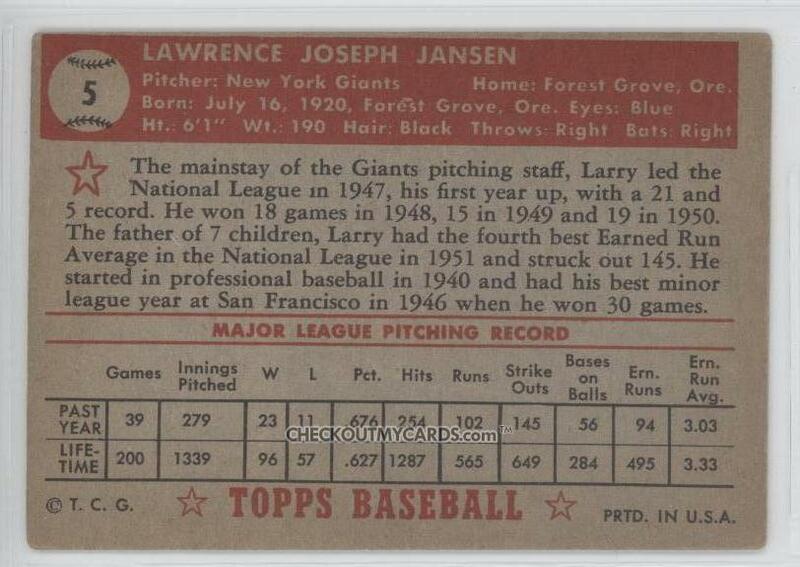 Fakes / reprints: Topps went back to 1952 again and again, reprinting star cards, high numbers, and (at least twice) the complete set. No doubt folks also faked them, so be wary of too-good-to-be-true deals and online auctions with fuzzy scans. Wow... you're right. That card truly does have "character". Thanks for sharing!